While finishing chemotherapy for testicular cancer in the spring of 2010, Chris Pilat heard Imerman Angels Founder Jonny Imerman speak at a cancer survivor event held at Edwards Hospital in Naperville, Illinois. Inspired by the mission of Imerman Angels and Jonny’s story, Chris made the decision to run his first marathon ever as a member of Team Imerman Angels. And in the fall of 2010, with zero history as a runner before he joined Team Imerman Angels, Chris did just that – completing the Bank of America Chicago Marathon. “I could not even run a block a week after chemotherapy, plus I was never a runner before, but it was a challenge I rose to,” he says. Chris had such a positive experience participating in the marathon with Team Imerman Angels, he ran in the Chicago Marathon from 2010 through 2014, taking 2015 off, and he is running again in 2016. As a resident of New York City since 2011, he is adding the TCS New York City Marathon to his roster of Team Imerman Angels events this year. “My experience at the Chicago Marathon has always been beautiful. I never go into it with an ‘I have to win’ mentality. I just feel privileged to be able to run with the organization and help people who have gone through something so severe. Chicago is a great place to do it because everyone is so open, friendly and empathetic. I decided to participate in the New York City Marathon this year as well because I want to help raise awareness of Imerman Angels out there, too,” he says. Chris was just 27 years old when he was diagnosed in January 2010 with stage 2 testicular cancer that had spread to lymph nodes in his abdomen. He had surgery shortly after his diagnosis, followed by chemotherapy. By June of 2010, Chris was in remission. Jonny stayed in touch with Chris following treatment, sharing encouraging and uplifting words, and Chris paid it forward by becoming a Mentor Angel to several people a year after he finished his cancer treatments. “Looking back, I wish I had known about Imerman Angels during my battle with cancer because I think it would have helped to talk to someone who had been through the same thing. After the fact, it was nice talking to Jonny about what he went through because we both had testicular cancer,” Chris says. Chris wants to help more cancer fighters, survivors and caregivers get matched with a Mentor Angel, and this desire fuels his passion for running with Team Imerman Angels. “If one person gets connected to Imerman Angels because of me or one of my friends running, it is totally worth it,” he says. 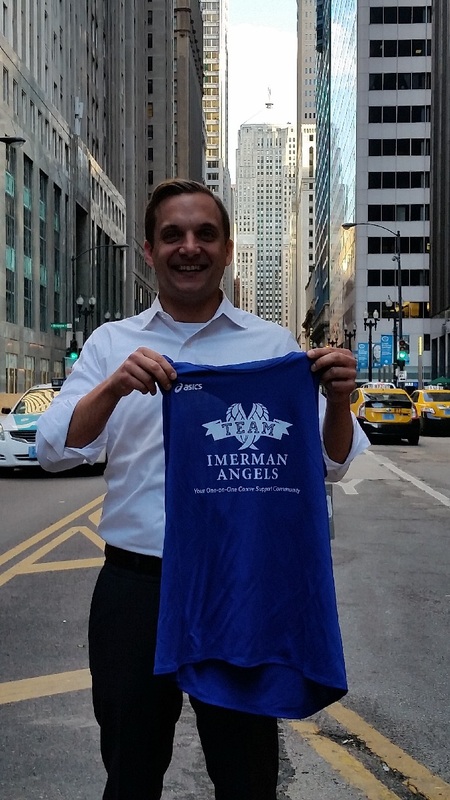 Join Chris on Team Imerman Angels for the 2016 Bank of America Chicago Marathon on October 9 to raise funds and spread awareness, to ensure that no one faces cancer alone.